Before we find out what those Sentinels are up to, lets pause to check out the side story in the back of issue 57. Marvel Girl is finally getting her time in the spotlight. She’s shared issues with Scott, but this is the first time the series has spent any significant time on her specifically. To mark the occasion, Marvel actually allowed a woman, one of the “supposedly weaker” gender, to write a comic book. But how will she manage that with her smaller, more lady-like brain? Immediately I’m wondering just how sexist this segment will be, and just how much of that sexism we can blame on “the times”. The first thing Jean says here makes me think that my suspicions were correct, but the second thing she says leaves me feeling that perhaps I assume too much. Lets not overthink this. Give Marvel the benefit of the doubt and all, right? I mean heck, these days Thor and Captain Marvel are both women. So lets get back to Jean and her cool powers. 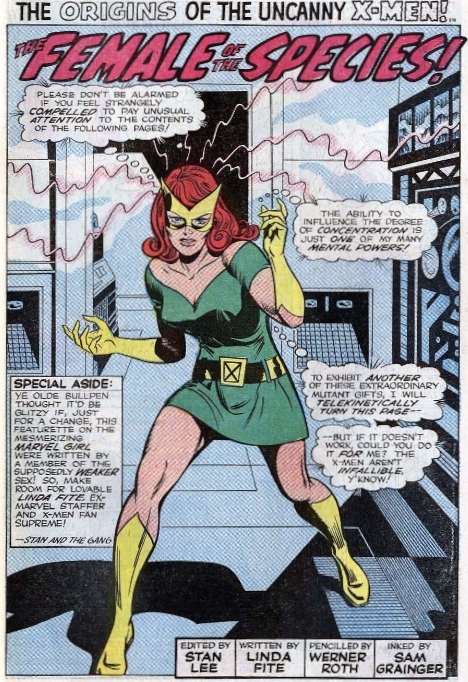 This will give us a look into her mutant abilities and all of the amazing things she can do.